Sustainable Investing is hot right now; a Google search reveals a plethora of SRI (Socially Responsible Investing) or ESG (Environmental, Social and Governance) funds in the pipeline as Fund Managers rush to meet demand for these products. 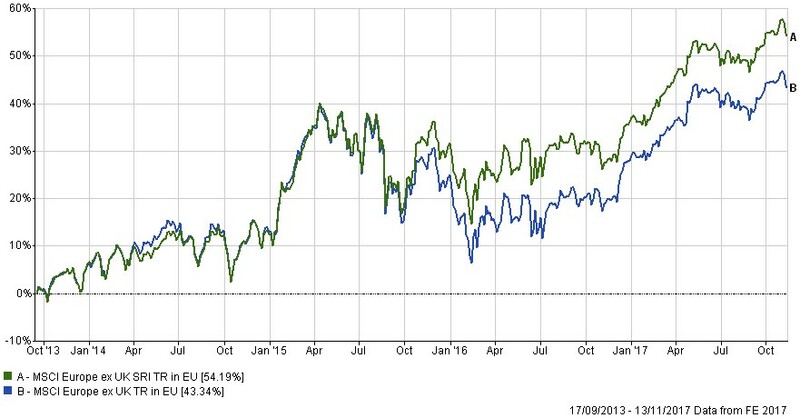 The epicentre appears to be Europe (and the following chart may explain why), but it is catching on all over the World as Pension funds join Retail investors into the next “new” thing. Naturally, the Fund Management industry has a product to sell, leading to a clamour as they all try to be heard. As usual, UK Local Authorities appear to be behind the curve, however, causing embarrassment as they face Activist clamour for change. They may find it harder to persuade their Trustees and pensioners that it is the right thing to do, though, as the chart below highlights. But there are still issues, which don’t appear to have been ironed out as of yet, the main one being problems of definition of what is, or is not an SRI/ESG compliant asset, (some funds exclude companies that are deemed to have failed the “test”, whilst others actively seek out those who fit the criteria to invest in). These definitional differences lead to some funds owning Coca-Cola, arguably responsible for the spread of Obesity and Diabetes, whilst others own Apple (whose overseas partners have a bad reputation for working conditions for their staff). This means that Investors may not get quite what they expect from their investment exposures. Reasonable people can quite reasonably disagree about what it means to be Sustainably invested- there is a world of difference between Land Mine manufacturers and Diageo for example, (or at least in degree). Would British Aerospace be shunned? Is being underweight in Utilities and Oil stocks ”Sustainable”? Is being out of them altogether sustainable from an Investment perspective? Would it be permissible to own Venezuelan bonds given the recent political crisis, with the consequent violence that is occurring (ignoring for a second the strong likelihood of an imminent default!) It depends on a personal view, which will be different according to whom you ask. Given the smaller investment universe implicit in SRI, (as many, perhaps a majority, of companies will not qualify for inclusion in SRI/ESG portfolios), the risk is one of over-concentration – exposure to one subset of the market increases idiosyncratic risk and should one company be found to be less than scrupulous in its adherence to Sustainable Investing for example, the risk is one of a considerable number of investors all trying to sell at once, leading to sharp price declines. A worst-case scenario would involve Investors losing faith in Sustainable Investing altogether, whereby all of these assets would fall simultaneously. All the above suggests that a compromise may be required – it is important to remember that not owning a particular share will make little difference to the Company concerned, as it has no effect on its cost of capital since shares are bought (or not) in the secondary market. As long as the Company has a reasonable credit-rating it will have no trouble raising capital from Institutions and so can carry on as normal. Maybe, the solution to this is to invest in a fully diversified Index fund and donate a proportion of profits to a named charity, thus ensuring that society as a whole benefits from the gains made thereby. Thus, the desire to do the right thing is balanced by the need to maximise returns. It is a messy world and no one solution will fit all circumstances or for all people. Finally, will investor’s principles survive a bear market? Years of strong market gains have allowed us to assume price appreciation, which may not occur in the future. 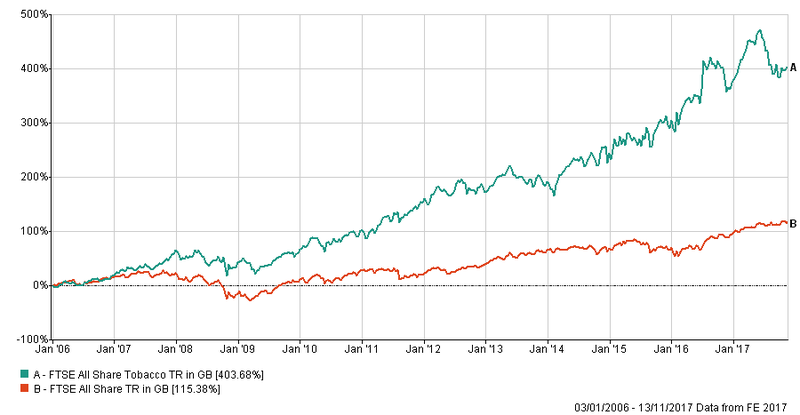 SRI/ESG principles are relatively easy to hold when markets are rising 10% per annum, but what if they stop? If a Bear market were to occur, there could be sharp price declines which in turn could cause a wholesale re-evaluation of the whole thesis, as advisors find that the cost of these principles may be too much to bear, both for themselves (and indeed their clients). In the 10 years from November 2006, the FTSE 350 Electricity Index and the Gas, Water and Multiutilities Indices beat the FTSE 350 Index by 1.91% per annum annualised, though concerns over Price Caps (and the prospect of Jeremy Corbyn’s Labour party winning the next election) has all but wiped away that premium over the last year. Alistair Meadows is a veteran of stock markets having started his career in the City of London during the heady days of the mid 1980s. After 10 years he moved into (active) fund management in 2000. He repented of his ways and joined EBI in 2014 and is now responsible for helping advisers and investors get the same flow of timely information and quality analysis that is available to professional investors. He qualified as a Chartered Financial Analyst in 2005, and refreshed his skills in 2015 by gaining the Investment Management Certificate. He can be contacted at alistair@ebip.co.uk.